There has been a slight change in plans regarding the bookcase. They were delivered as promised, but the gentleman who is going to put them together is unable to do so until Monday. His week has turned out to be busier than he expected. Since there is no absolute need for the bookcase until late November there is no problem. There is not much on today’s agenda. I have a meeting of the veteranos and I imagine that we will go out for lunch. Speaking of lunch, we had lunch yesterday at a small Moroccan restaurant called Al Adwag. It is located on Calle La Nave 16. It is a very small place with maybe six tables. It has a very limited menu, but they do have a menu of the day. 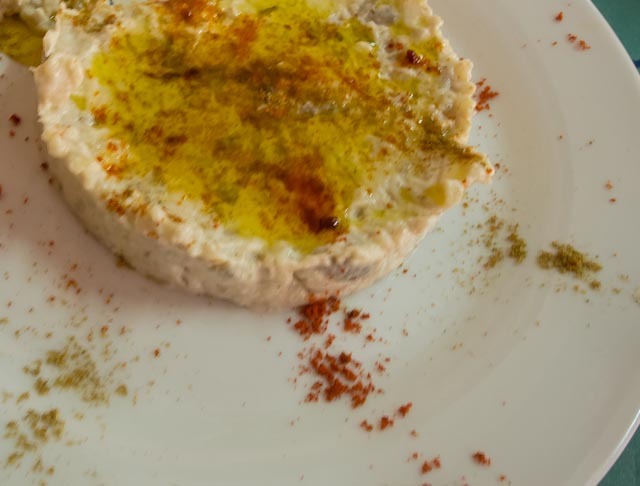 Susan chose from the menu of the day and started with some imtabal – sometimes known as babaganosh – it is an eggplant dip that has a smoky taste to it. It was served with triangles of pita bread. 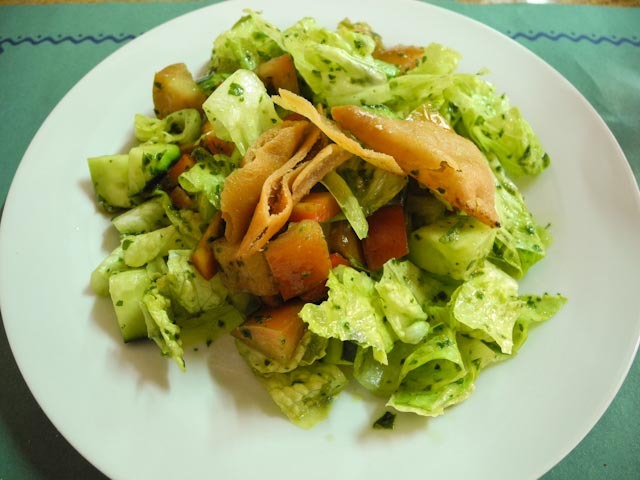 I started my meal with fatoush – a salad consisting of lettuce, tomato, cucumbers and toasted pita served with a lemon based dressing. Both starters were very tasty. 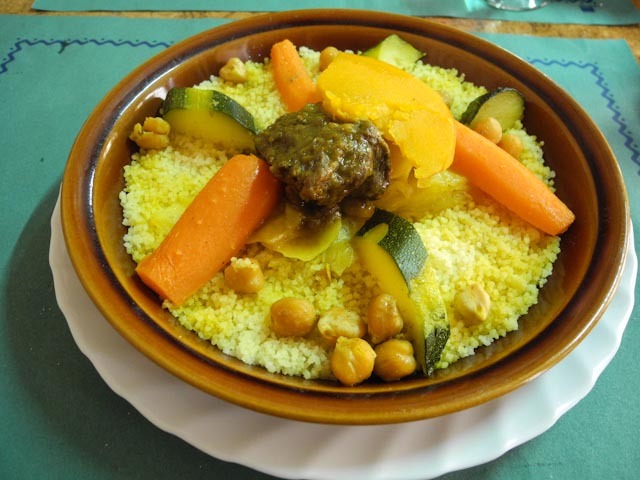 Susan main dish was essentially a vegetable couscous although it did contain some bits of veal. 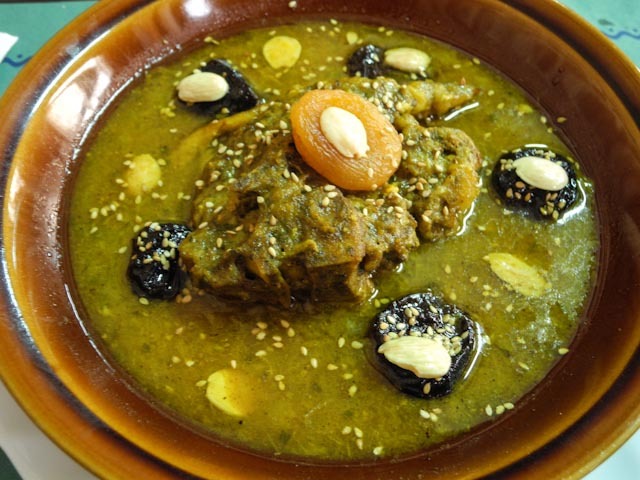 I had a lamb tajin served with the traditional accompaniment of dried fruits, almonds, sesame seeds and cinnamon. The couscous was very flavorful. The couscous was very flavorful. My tajin was very tasty, but it had an abundance of bone and very little meat. That was the only downside. I would consider going back, but I think I would choose from the vegetarian dishes on the menu. I still think the best Moroccan food experience in Valencia is available at Ducala. Our evening was uneventful. With all our comings and goings yesterday we managed to walk five miles and we were both a bit tired. We had a light supper. Susan made a frittata with goat cheese, ham and onions and after supper we spent some time reading and watching a bit of TV. Bedtime was at midnight.